- 2 of Lv300 Limit 15 stars Mevius Equipment are guranteed to win! "Mevius Fest" now on sale! - Win "ORB Remover ∞" with 3 Gems for 1 spin! 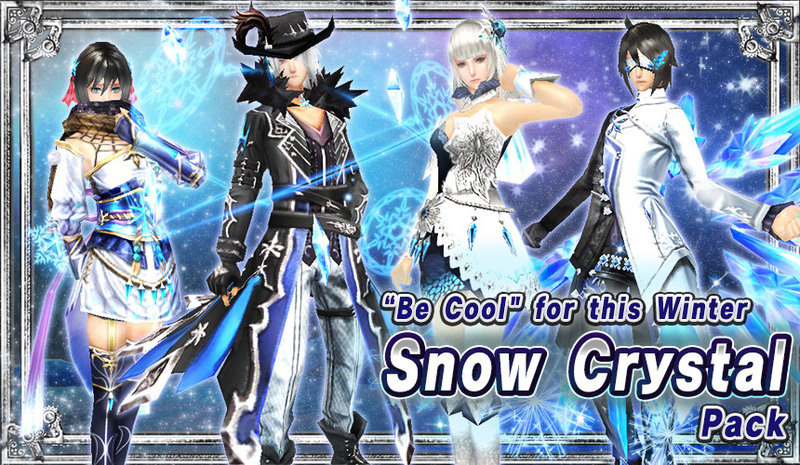 - "[Costume Avatar Mystery Bag] Snow Crystal" is on sale!2 of Lv300 Limit 15 stars Mevius Equipment are guranteed to win! "Mevius Fest" now on sale! Win total of 10 items from above! Also, 2 of the winning equipments will include "Lv300 Limit 15 stars" guranteed! This pack is only limited to Paid Gems only. Don't miss this chance! Paid 50 Gems per "Spin x1"
*Able to purchase with Paid Gems only. *Can be purchased 5 times for each account. * Arms within the Pack have equip level limit set. When equipping with the character below the level limit, it will not activate the original ability. *Armors within the Pack have equip level limit set.When equipping with the character below the level limit, it will not activate the original ability. Win "ORB Remover ∞" with 3 Gems for 1 spin!Essential to replace the ORB! We will be starting "ORB Remover Fantasista" to win "ORB Remover ∞"! At affordable price of 3 Gems for 1 spin, and a chance to win maximum 3, so don't miss it! 3 Gems per "Spin x1"
30 Gems per "Spin x10"
"[Costume Avatar Mystery Bag] Snow Crystal" is on sale! 5 avatars can be obtain from 12 Gems per a Spin! "[Costume Avatar Mystery Bag] Snow Crystal" now on sale! as well as 1 seasonable accessory! Chance to obtain various types of avatars! One of the each part of avatars above will be included. * Each colors of "Bunny PJs Tops" are listed in lineups of "Upper Avatar".